Considering MLB.com's No. 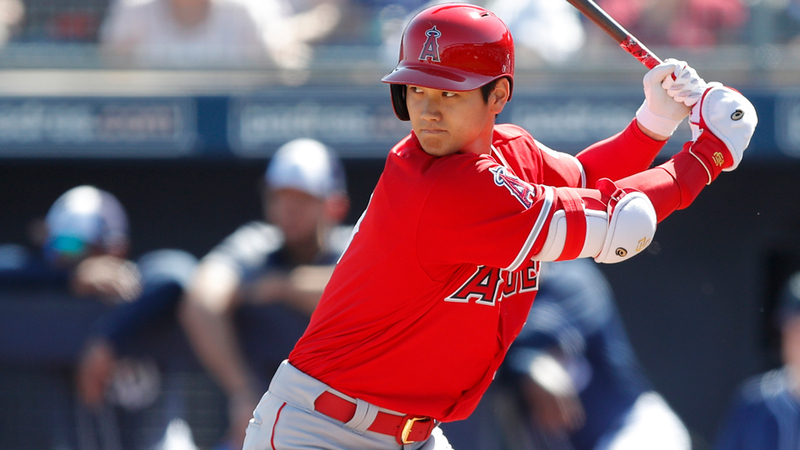 1 overall prospect as a position player only, Shohei Ohtani still ranks as the No. 4 outfielder in the game. There may be lingering questions about how he adjusts to pro ball in the States over the coming months, but his potential as a left-handed hitter is thrilling. His power rates a 70 on the 20-80 scouting scale, and he has an average contact bat and plus speed. Obviously, his arm is an asset in the outfield. But Ohtani is just the tip of the Angels-rebuild iceberg. Not so long ago, this was one of the weakest systems in baseball. Outfielders Jo Adell (No. 62) and Jahmai Jones (No. 93) are recent Draft prizes, and shortstop Kevin Maitan (No. 87) signed with the Halos in December after being named a free agent as a penalty to the Braves for violating international signing rules. Outfielder Brandon Marsh and first baseman Matt Thaiss add a bit of depth. Never an under-the-radar player, No. 7 overall prospect Nick Senzel nonetheless managed to boost his stock with a phenomenal first full year. He batted .321/.391/.514 with 40 doubles, 14 homers and 14 steals over 119 games between the Class A Advanced Florida State League and the Double-A Southern League, becoming one of the best all-around offensive players in the Minors in the process. Once subject to speculation that he wouldn't be able to remain at third base, Senzel has dashed any doubts. Work at other positions is only increasing his versatility at this point, and Cincinnati fans can expect to see him at The Great American Ball Park sooner than later. Outfielders Taylor Trammell (No. 43) and Jesse Winker (No. 82) make the Reds one of seven teams with at least three position-playing prospects in the Top 100. But there's a big gap between Senzel and the other two and the system doesn't have as much exciting depth behind the top trio as many of the below teams. Still, Cuban shortstop Jose Israel Garcia could wow with his stateside debut this year, and outfielder Jose Siri and catcher Tyler Stephenson are worthy of notice. Does Fernando Tatis Jr. have your attention yet? The No. 8 overall prospect and son of the former big leaguer showed hints of his capabilities in complex and short-season ball during his 2016 debut, and last year, everything became crystal clear. The shortstop's 21 home runs and 29 stolen bases over 117 Class A games made him the first 18-year-old to join the 20-20 club in the Midwest League, and that power and speed combination is made all the more dangerous by his selectivity at the plate. Tatis led the loop with a .390 on-base percentage and 75 walks. The Padres had him jump all the way to the Double-A Texas League for the last couple weeks of the year, and although his numbers were solid there, they especially liked the maturity he showed in making the transition. Fellow middle infielder Luis Urias followed a Class A Advanced California League MVP campaign in 2016 with an All-Star season in the Texas League last year. A fantastic contact hitter, the No. 36 prospect works the count -- in 2017, he walked 68 times and struck out 65 times -- and laces line drives. On defense, he's got range with a slick glove and an arm suitable for throws from the hole. While Tatis might have stolen some of his thunder, third baseman Hudson Potts slugged 20 homers and 23 doubles for Fort Wayne last year. Drafted out of high school in the first round of 2016, he needs to show better control in his at-bats but projects as a quality big league hitter. Outfielders Jorge Ona and Michael Gettys have some exceptional tools -- Gettys' arm rates a 70. Second baseman Esteury Ruiz could demand a share of the spotlight in his full-season debut this year. In a year of multiple astounding breakouts in the Minors, outfielder Ronald Acuna's was perhaps the most impressive. He started in the Florida State League, but by the first week of May, he played his way up to the Southern League. That circuit only contained him for 57 games, and he wrapped up the regular season with 54 games in the Triple-A International League. Shockingly, the higher he moved up, the better he hit -- for both average and power -- finishing with a .325/.374/.522 slash line across the three levels. He went on to the Arizona Fall League, where at 19 he become the youngest AFL MVP in history. There's no part of his game that lags terribly far behind any other -- it's all strength for the No. 2 overall prospect. Third baseman Austin Riley (No. 97) probably would have garnered a lot more attention last year had it been possible for anybody to take their eyes off Acuna. The 2015 CBA pick turns 21 on April 2 -- three days before Opening Day -- has plenty of pop and made progress in cutting down his strikeouts and increasing his walks. If he continues that trend, he'll develop into a considerable headache for Major League pitchers. A lot of the rest of the top-of-the-line talent in the Atlanta system is wrapped up in hurlers, but outfielder Cristian Pache could be the top prospect in a weaker organization. Catchers Alex Jackson, Brett Cumberland and William Contreras make for some real depth behind the plate. Infielder Travis Demeritte and outfielder Drew Waters also bear watching. Sixth overall prospect Victor Robles can do anything on the ballfield, and has. After batting .300 with 27 steals and 10 homers between Class A Advanced Potomac and Double-A Harrisburg last year, he played in the Majors and the AFL, where he was the MVP of the Fall Stars Game. The 20-year-old native of the Dominican Republic is the most promising of an admirable crop of toolsy outfielders in the Washington organization. None of them have quite the same total drool-inducing package, but Juan Soto (No. 29) may be just as good a hitter, and Daniel Johnson is nearly as well-rounded without the sky's-the-limit ceiling. Blake Perkins and Andrew Stevenson add depth beyond that trio. Carter Kieboom (No. 90) is to Nationals middle infielders what Robles is to the outfielders -- the far-and-away standout among multiple legitimate prospects. A 2016 first-rounder, the shortstop is once again ticketed for his first full season after a mid-May hamstring injury limited his Class A South Atlantic campaign to 48 games last year. He turns 21 on Sept. 3. Seventeen-year-old Luis Garcia has quick hands at the dish and quick feet on the dirt. His speed is his best tool, but he also has a strong arm and may develop considerable power in the future. Switch-hitting shortstop Yasel Antuna can crush it from the left side and is disciplined on both sides, although he struggled against southpaws (5-for-35) as a 17-year-old in the Gulf Coast League last year. He may end up at third base. Chicago's rebuild was already progressing remarkably well when they snared Eloy Jimenez from the North Side of town in last summer's Jose Quintana swap. During his final weeks in the Cubs system, the No. 4 overall prospect evoked the movie The Natural with a field light-shattering homer in the Carolina League All-Star Derby. It was a fitting display, because "natural" is a great descriptor of Jimenez at the plate. He has monster power and an advanced approach, helping him to post a .379 OBP, 19 homers and 22 doubles over 89 games across two Class A Advanced teams and Double-A Birmingham in 2017. Outfielder Luis Robert (No. 28) is another relatively new arrival. The White Sox inked the Cuban defector last May, and his offensive game has drawn comparisons to that of Yoan Moncada. Athletic Blake Rutherford, another outfielder and the No. 99 overall prospect, came into the system in the mid-July Todd Frazier trade with the Yankees. Third baseman Jake Burger, a 2017 first-rounder, suffered an Achilles heel injury in Cactus League action Monday, which will cost him the year. Healthy, he projects to be a dangerous hitter with above-average speed for his size and position. It's possible Zack Collins will be moved from behind the plate, but his ability to get on base will make his club want to get him into the lineup any way it can. Second baseman Scott Kingery, a 2015 second-rounder, began to separate from the pack with a strong showing in his first full season -- which culminated with 37 games at Double-A -- but last year he truly moved into the upper echelon of prospects. Having entered the campaign with eight professional homers, he began driving the ball all over the field with greater frequency while developing his advanced approach, resulting in 18 dingers over 69 games for Reading and eight more in 63 games with Triple-A Lehigh Valley. The performance catapulted him to the No. 35 overall prospect, ahead even of shortstop J.P. Crawford (No. 37), who rebounded from a rough first half at the dish with the IronPigs in the IL, batting .287 after the All-Star break and getting into the Majors for 23 games. It's a double-play combo that might become the envy of the National League East -- and maybe all of the bigs -- this year. Outfielders Mickey Moniak (No. 88) and Adam Haseley (No. 95) are farther away, but not a whole lot less worthy of excitement. Jorge Alfaro is a lightning-armed catcher with plenty of power. Arquimedes Gamboa and Daniel Brito, two 20-year-old shortstops, are very intriguing prospects at lower levels. We may be at the dawn of a revitalized Yankees dynasty. The system that just graduated Aaron Judge to Rookie of the Year honors lost very little prospect power in adding 2017 National League MVP Giancarlo Stanton. Gleyber Torres, whom the Bombers acquired from the Cubs in the 2016 Aroldis Chapman deal, is the No. 5 prospect in baseball. The shortstop saw reps at second and third last year and is above average anywhere in the infield. His season was cut short by an elbow injury to his non-throwing arm last year, but he's at full health and battling for an early-season roster spot. Before getting hurt, he played his way up to the IL after just 32 games at the Double-A level. In his first taste of the Minors' highest rung, he hit .309 with seven extra-base hits in 81 at-bats, which squares well with projections that he'll grow into a high-average hitter with plus power in the Majors. Were Torres' the only top-shelf prospect, New York's system would still be in pretty good shape. But outfielder Estevan Florial (No. 44) is poised to be one of the most electric players in the Eastern League this season, and like Torres, third baseman Miguel Andujar (No. 65) appears ready to rake in the big leagues right now. Speedy and versatile infielder Thairo Estrada has a superb glove, and he hit .301 over 122 games during his first look at Double-A. With No. 3 Vladimir Guerrero Jr. and No. 13 Bo Bichette, Toronto is the only system with two position players ranked in MLB.com's first 15 spots. That young duo with big league pedigree deserves all the attention earned last season. Guerrero has an 80-grade hit tool and 65 power, and his arm is above average at third base. Even if Bichette doesn't stick at shortstop -- and he very well may -- he profiles as an excellent defender elsewhere in the infield. His contact rates a 70. In 2017, he out-homered Guerrero, 14-13, and out-doubled him, 41-28. The excitement over this pair makes it easy to forget the Blue Jays also have Anthony Alford, a very good hitter and great center fielder (his outstanding speed adds more value than his mediocre arm detracts). A natural athlete, the former Mississippi defensive back has impressed the Jays with how quickly he's refined his game. Catcher Danny Jansen climbed three levels last season and is one of the top-10 backstop prospects in the game. Five-tooled shortstop Logan Warmoth, the No. 22 overall pick in last year's Draft, gives Toronto fans another strong piece to imagine in a Guerrero-Bichette-led infield. Richard Urena, another shortstop, may not be on the same plane as the other names here, but he is a hitter with a nice arm. The Rays may not have the sexiest system in baseball -- they lack a prospect who ranks among the top 10 -- but in terms of high-quality position players, they undeniably have the deepest. Middle infielder Willy Adames (No. 22) has been one of the youngest players everywhere he's played since debuting in the Dominican Summer League in 2013, and he's consistently produced against more experienced pitchers. Last season, he handled Triple-A just as well as previous assignments, drawing praise for his defense at shortstop and his makeup and leadership while putting together a .277/.360/.415 slash line, belting 10 homers and 30 doubles and ripping off 11 bags. Like Adames, No. 25 overall prospect Brendan McKay is a potential multi-time MLB All-Star. While Ohtani has had an international spotlight since signing, fellow two-way player McKay doesn't quite match the Japanese superstar's raw power but could likely develop into the steadier hitter of the two. His advanced approach at the dish netted him a .342 OBP in his first crack at pro ball, and he did knock four balls out of the park in 125 at-bats with Class A Short Season Hudson Valley. Christian Arroyo -- a fair shortstop but considerable asset at second or third base -- has a low floor, and he made it hard to imagine where his ceiling might be when he scorched PCL pitching (.396/.461/.604) over 25 games to force a callup to the Giants last year. He missed almost all of the rest of the season after taking two pitches on the left hand and requiring surgery. Tampa Bay picked him up in the Dec. 20 Evan Longoria deal, and there's no reason to suspect the No. 81 overall prospect won't be a healthy and significant contributor in due time. No. 57 prospect Jesus Sanchez was 19 for all of last season, but he had the second highest average (.305) in the Midwest League and laced 48 extra-base hits. Jake Bauers (No. 64) gives the Rays five prospects in the Top 100, more than any other organization. He may be limited to first base, but on the offensive side of the ball, he seems to be have very few limits at all. His 31 doubles in 2017 helped make him the only player in the IL with at least 20 stolen bases to tally 50 extra-base hits (he had 13 homers and a triple). Beyond that quintet, shortstops Wander Franco (who's 16) and Lucius Fox and outfielders Justin Williams, Garrett Whitley and Josh Lowe might be headliners in another system.